Murphy’s Law: “Anything that can go wrong will go wrong” is an old adage aptly applied to the sinking of the passenger liner SS Vestris, November 12, 1928. There was a late SOS; bungled lifeboat launchings; a negligent crew; an over-loaded cargo hold and nearby vessels without radios. In addition, poor judgment and neglect became major culprits in Murphy’s mandate. Owned by Lamport and Holt (L & H) Liverpool, England, the liner left New York November 10 on a routine voyage to Buenos Aires, Argentina. 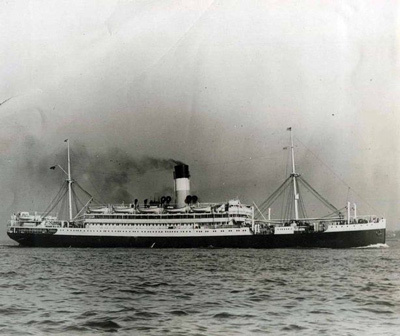 The ship’s tourist appeal, combined with a return cargo of coffee and general supplies, helped its 83-year-old company become one of the trailblazers in South American trade. 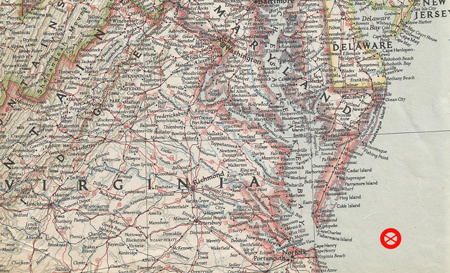 A day after leaving port, the steamship ran into a “moderate northeast gale” about 200 miles off the coast of Virginia. The seas were heavy, but not menacing when a leak appeared in a partially open coal hatch door that caused the ship to list to its starboard side. Despite the hazardous circumstance, Capt. William Carey failed to send an immediate SOS. 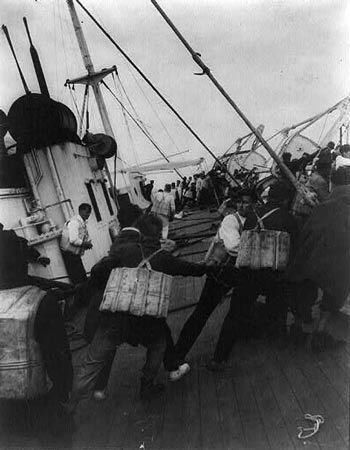 Crewman Fred Hanson took this photo of passengers scrambling to the lifeboats on the listing ship. The ship started leaking on November 11 and it wasn’t until 10 a.m. on November 12 that the first SOS went out, but it misstated the ship’s position by 37 miles. A second one was sent at 11 a.m. and soon after that, the captain gave orders to abandon ship. The ship sank at 2 p.m. with rescue vessels arriving late that evening and in the early morning hours of November 13. The steamships Myriam, Berlin and American Shipper, accompanied by the battleship USS Wyoming, rescued the survivors. Capt. Carey’s efforts failed from the start as he tried to pump out the water filled ballast tanks responsible for the distribution of weight. The hull leaned to such a sharp angle, passengers could barely move in their cabins. Those who made it topside found the deck awash. As the cargo shifted and the tilt increased, the captain wired for help. Murphy’s Law persisted after the first SOS misstated the ship’s position. In the ensuing turmoil, two lifeboats were swamped and one sank. Some of the crew ignored the passengers and lowered lifeboats for themselves. While estimates of the misfortune varied, final accounts revealed 111 losses from the complement of 325 passengers and crew aboard ship. None of the 13 children and only eight of the 33 women aboard survived. The captain went down with his ship. The 496- foot, 10,500 ton leader of the L & H line sank 200 miles off Hampton Roads, Virginia, in waters over one mile deep. In loss of lives, the Vestris doesn’t match those who passed in the sinking of the Titanic, Lusitania or the Empress of Ireland, all disasters that shouldn’t have happened. But it was perhaps more shocking and sad that the captain’s imprudent delay in communication could have been avoided and loss of lives drastically reduced. Recriminations began flying when the rescue ships arrived in port. The negligence of the captain, crew and the ship’s owners, who were British, made headlines on both sides of the Atlantic. Facing multiple lawsuits, Lamport and Holt quickly settled out of court for 100,000 GBP (British pounds), thus preventing testimony of the scenario from appearing in court. Murphy’s Law didn’t totally overshadow the Vestris tragedy. Another old adage, “Every cloud has a silver lining,” surfaced at the International Convention for Safety of Life at Sea (SOLAS) held in London the following year. Future sailors and passengers benefited from striking testimony presented by rescue crews. They said many bodies were found face down even though they were wearing cork life jackets. As a result of this disclosure, the U.S. Merchant Marine authorized kapok life preservers that would keep an unconscious person’s face and head above water. This won significant acceptance and many seafaring nations followed suit. Ellsworth Boyd, Professor Emeritus, College of Education, Towson University, Towson, Maryland, pursues an avocation of diving and writing. He has published articles and photo’s in every major dive magazine in the US., Canada, and half a dozen foreign countries. An authority on shipwrecks, Ellsworth has received thousands of letters and e-mails from divers throughout the world who responded to his Wreck Facts column in Sport Diver Magazine. When he’s not writing, or diving, Ellsworth appears as a featured speaker at maritime symposiums in Los Angeles, Houston, Chicago, Ft. Lauderdale, New York and Philadelphia. “Romance & Mystery: Sunken Treasures of the Lost Galleons,” is one of his most popular talks. A pioneer in the sport, Ellsworth was inducted into the International Legends of Diving in 2013. 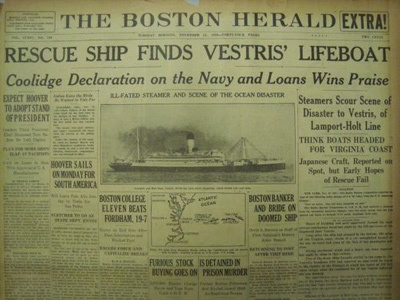 Enjoy history and really enjoyed your article on the SS Vestris. Many thanks. I appreciate your interest and comment. This incident almost eluded me. A friend suggested I research it. The Vestris hasn’t received much attention throughout the years. It was a sad disaster and one with enough warning that it could have been prevented. Mr. Boyd: I love reading your articles. Keep writing!!!! Thanks George. I enjoyed researching & writing about the Vestris. Interesting that you asked about a book. I’ve been thinking of putting my articles into a book. I have enough of them to do so. I would, however, like to find a publisher and not have to self-publish it. Well, I’ll tell you that this would be one ship that I never would have been on. I can’t believe the incompetence of the whole ship. If you were going to run a ship you should make sure everything checks out before you leave the docks. When you do not seem to have your equipment then you should not be going out in the water going anywhere. Not only that, but when you dare take passengers on a boat that you cannot even maintain then you put the passengers at risk. Apparently the ship and its crew were so inexperienced that they should not even have been there. They cannot blame it on murphys law, but on human ignorance. Otherwise, I do, again, appreciate the historicity of this article. You are right. But in this case it was mainly the captain’s fault since he was making the major decisions. I don’t see any “blame” in Murphy’s Law. Murphy’s Law is simply a statement, a saying whereby it simply means circumstances go all in one direction. Everything that happens leads to complications, one after another. I experienced Murphy’s Law when I tried to build a tree house for my kids. Everything went so wrong I had to hire someone to do it. Thanks for writing to Numa.net.